InsertText for Outlook gives you a QUICK and EASY way to enter text into your e-mails. Position the cursor where you want the text to appear in your e-mail and then click InsertText on the toolbar to display your list of pre-written templates. 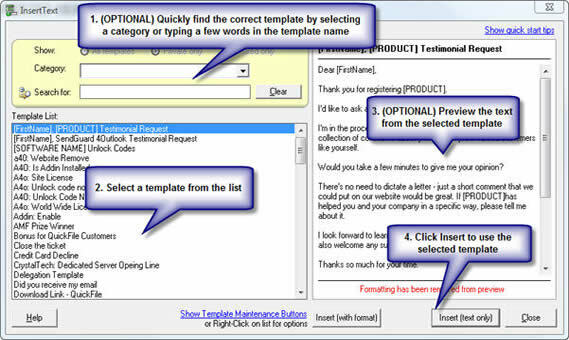 Select your template from the screen and then click Insert. The text will be written to your e-mail. Easy as that! Click Order InsertText Add on for Outlook to purchase a licensed copy. This way, you can try InsertText without risking a cent of your money.